A year and a half ago, Mel and Helen King noticed their very fast poodle Josephine slowing as she ran the agility courses on which she had become a champion. A few weeks later, she became lame. After researching options, the Kings opted for stem cell therapy, part of the rapidly emerging field of regenerative veterinary medicine. 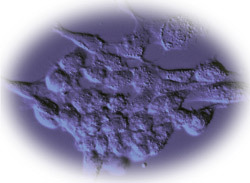 A photomicrograph of a cluster of equine adipose-derived regenerative cells. The techniques are being used in horses and dogs to treat tendon and ligament injuries, osteoarthritis and, to a limited degree, fractures. Stem cells are being used in other countries to treat humans with musculoskeletal problems, but the procedure is still in clinical trials in the U.S.
Vet-Stem Inc., a Poway, Calif., company founded in 2002, has used its patented process to treat more than 3,200 horses and 1,500 dogs. Some 1,179 veterinarians have completed the firm’s free online training. 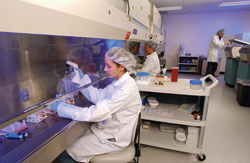 At Vet-Stem, highly trained employees process stem cells in sterile environments. Within four months, Josephine, now 9, was back in the ring and winning agility competitions. Vet-Stem founder and CEO Robert J. Harman, DVM, MPVM, predicts that within 10 years, regenerative medicine will be part of every veterinarian’s business. Imulan has commercialized the first and only approved treatment in the U.S. for feline leukemia virus and feline immunodeficiency virus. Arthrex Vet Systems of Bonita Springs, Fla., has focused on altering a patient’s blood to produce injectibles for treating osteoarthritis and soft tissue injuries in sport horses and dogs. The company’s IRAP II System—IRAP stands for interleukin-1 receptor antagonist protein—aims primarily at osteoarthritis and harvests serum in a process in which white blood cells bind to glass beads, producing regenerative and anti-inflammatory proteins after a 24-hour incubation period. Arthrex’s ACP System—for autologous conditioned plasma—results in plasma containing platelet-derived growth factors that are ready to be injected to treat soft tissue injuries just 10 minutes after blood is drawn. Arthrex veterinary consultant Hank Gendron, VMD, of Naples, Fla., began using IRAP to treat horses in 2003 and says he has achieved good results with both it and ACP. As entrepreneurs move ahead, academic scientists are exploring regenerative medicine at a more cautious pace. At Louisiana State University’s School of Veterinary Medicine, Mandi J. Lopez, DVM, MS, Ph.D., Dipl. ACVS, is focusing on using stem cells to treat cranial cruciate ligament disease in dogs, tendon injuries in horses and for bone regeneration in both. Clinical trials to treat tendon injuries are under way in horses, and clinical trials for treatment of cranial cruciate ligaments in dogs are in the planning stages. Dr. Lopez says her research has focused on ways to isolate and characterize specific kinds of stem cells and optimize them for specific applications, such as bone regeneration, which would be a significant advantage over the current treatment gold standard: bone grafts. She says she’s very optimistic. Stanford University’s School of Medicine reported in March that mice treated using stem cells showed increased bone healing compared with a non-injected group. And a group of surgeons in Germany reported success in applying fat-derived stem cells directly to fractures suffered by a 7-year-old girl with severe head injuries. Some practicing veterinarians also are cautious. Larry R. Overly, DVM, who treats racehorses in Cypress, Calif., has seen more stem-cell therapy benefit in osteoarthritis cases than in soft tissue trauma. But he says he has “not seen enough yet” to make a judgment. “I’d like to see studies done on enough horses to make a reasonable assessment,” Dr. Overly says. Harman began using stem cell therapy in horses in 2003. He foresees much greater use in internal medicine and in treating spinal cord injuries in both animals and humans in the next 10 years. He also predicts that in the next decade, universal stem cells, collected from donor groups, will be commercially available. This should reduce the cost of the treatment, which now runs $2,500 to $4,000, he says. Helen King says she was told there was no guarantee to the procedure for her dog and that it could last a week or a lifetime. “If her knees gave out tonight, I would do it again,” she says.